We run a series of camps here over the summer for the Sogn og Fjordane Red Cross (Ferie for Alle, youth camps etc) and for Lions Norway (Camp Fjalir). The Red Cross’ Ferie for Alle (Holiday for All) gives financially disadvantaged families with children an opportunity to enjoy a unique holiday experience for the whole family. Families are given a chance to enjoy good experiences together and create shared memories through a wide variety of activities that include both the children and the adults. There is also a Red Cross Children and Youth Camp for those with developmental disabilities, bringing young people together in an inclusive, fun and safe environment. 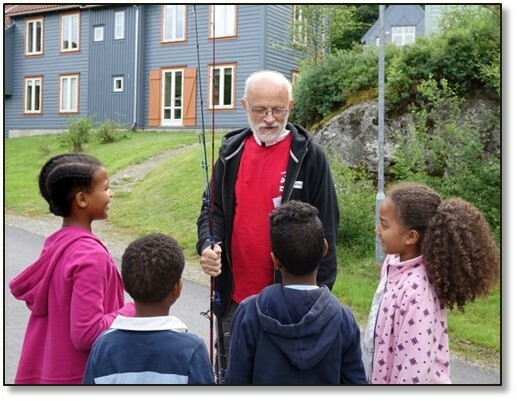 The Red Cross summer camps run on our campus during the summer season (and offered in recent years by the Sogn og Fjordane, Hordaland, Bergen and Møre og Romsdal Red Cross district teams) are an important part of the College’s partnership with the Red Cross. Being woken early in the morning by a Swiss, brushing your teeth standing next to a Dane, hurrying to class in the morning rush hour with an Uzbek, sitting next to an Angolan in class, being taught Economics by a Guatemalan, going to a Ghanaian to clear confusions in Maths, going for a run with a Brazilian; all these are little things that make this place beautiful. This place is special.